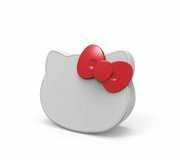 Hip music lovers will go wild over this rechargeable speaker inspired by the one and only Hello Kitty! Rock out to any playlist when you connect your audio device via Bluetooth. Featuring innovative sound technology developed by the audio experts at iHome, this speaker will make sure you never miss a beat!